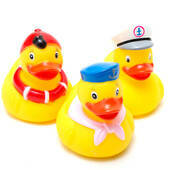 These great duck pond ducks are exactly the right duck for a traditional duck pond game. These ducks are designed to stay upright. The weight in these ducks are designed to keep the ducks floating upright so you can put a number on the bottom side of the ducks to reference a prize.